With Gas Boiler Breakdown Cover, if something goes wrong you can rely on one of HomeServe's approved engineers to get things up and running again. You can claim as many times as you like. If it’s a gas boiler breakdown, there’s no claims value limit as long as your boiler isn’t Beyond Economical Repair (BER). If it’s a Gas Supply Pipe claim, it is up to £4,000 per claim. 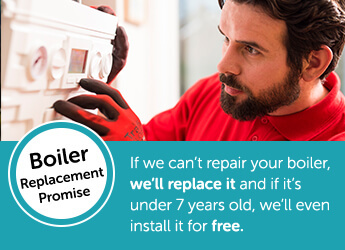 The best bit of all is, after 6 months, if your boiler is BER and less than 7 years old, HomeServe will replace it for free. Your boiler will be given a health check in the first year to make sure it can be covered. Your boiler must pass before any claims can be progressed. It’s easy to arrange and must be booked or completed within the first 90 days. When reference is made to 'we', 'our', 'us' and 'we're' this refers to HomeServe Membership Limited. The price will be different for existing and returning customers. The price will increase at renewal. Currently customers in their second year are paying £9.50 a month, £114.00 for the year for this policy, provided they have made no claims. Gas Boiler Breakdown Cover meets the needs of homeowners requiring assistance in the event of a breakdown of the boiler at their property. The price will increase at renewal. Currently customers in their second year are paying £9.50 a month, £114 for the year for this policy, provided they have made no claims. Your cover will automatically renew unless you tell HomeServe otherwise.